Let's Stamp! : 2012-2013 Idea Book & Catalogue Blog Hop! It's the 1st October, which means that after admiring it for the last few months, I can now share the super thick new catalogue with you all! As always, there is a blog hop to accompany the new catalogue launch. If you have arrived at my page after visiting Emma's page, then welcome! If not, you might want to pop back and take a look at the wonderful creations Emma has made. Sarah's blog should be next but Sarah is obviously beavering away at work, so whilst we are waiting for her blog to update why not hop on over to Sandra's blog, who is the blog after Sarah. I hope you enjoy the blog hop and all of the creative inspiration! Now I have to confess that time rather flew away from me and as I wasn't happy with my first attempt, I searched the internet for inspiration, so my card is a copy of someone who is far more talented than I! The original card can be seen on Julie's blog. Hopefully, if I manage to shift this cold, I'll be able to show you some original ideas with this fab new stamp set and punch later this week. Colours: Pool Party, Nearly Navy and the new In-Colour Raspberry Ripple. You can't tell from the photo, but I've also sprayed the pool party cardstock with some homemade shimmer spray using Stampin Up! Frost White paint. This is such a cute card. I think I may have to buy the mitten punch and stamp set. Thank you for sharing. 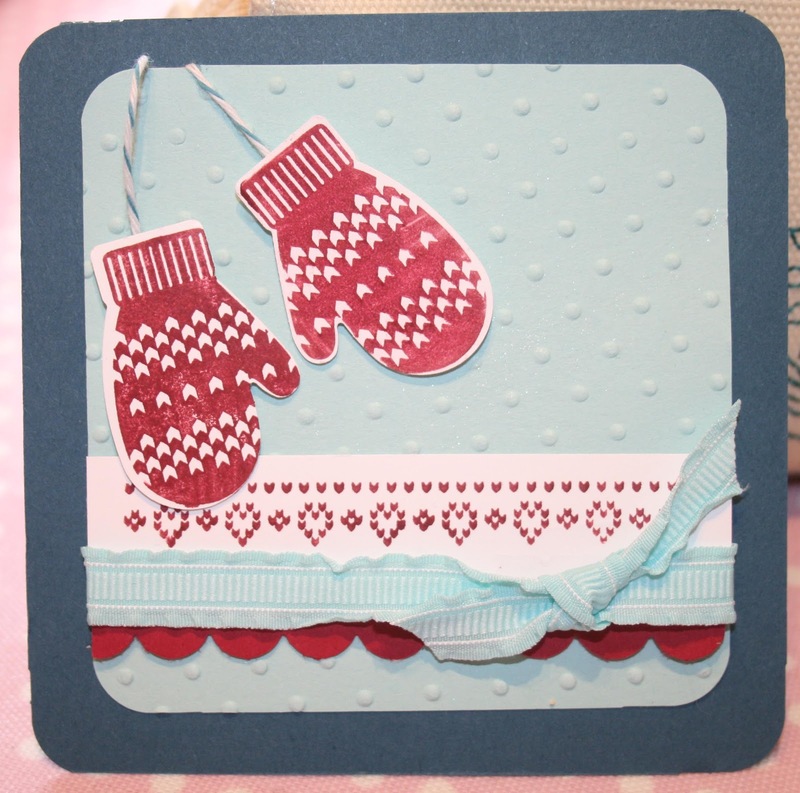 Great card.. Those mittens are just fab! Hope your cold has gone by now!